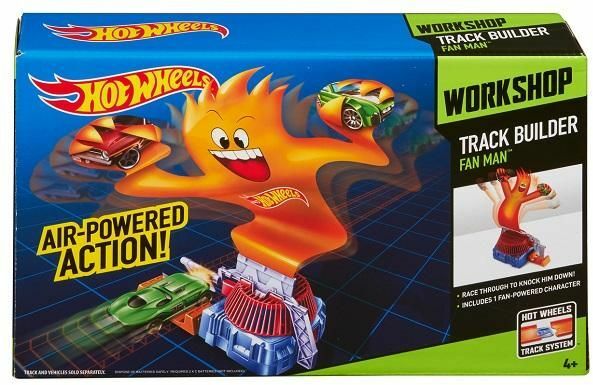 Spin some fun into your Hot Wheels® track sets with Fan Man™. Straight from waving wildly in front of a Hot Wheels® City store, Fan Man™ adds an exciting challenge to any track. Do you have what it takes to race past him, or will your car be caught in his grasp? The Hot Wheels® Track Builder System offers the ultimate track experience for boys by allowing them to design, create and customize their very own track challenges. Using a variety of stunts, layouts and essential pieces that work together or connect to existing sets, boys can be the master of their own track. Rev up the track with this set that features built-for-speed electronic stunts with a motorized kicker for maximum speed.